On August 2nd, I shared with you how to do a master bath remodeling project step by step on your own. See: How to do it for less... Not having to hire a contractor or a bath solutions company saves you thousands of dollars. These companies have to obviously make money to stay profitable, and this means charging the homeowner a premium to what they pay out for subs, material, and other expenses. The knowledge, experience, and resources these companies and contractors have is not out there for everyone else to get their hands on. Therefore, the little guy needs help anyway they can get it, and that was my motivation for the August 2nd post. If you read part 1 of this series, you are probably waiting to see pictures and numbers. First let me show you how to remove a bathroom sink so you can have access to demo the tile on the counter. Remember, if you can do some of the demo, you will save lots of money! Tiling the shower pan came next, as well as the installation of the new shower, bathtub, and sink fixtures. We were almost ready to be able to take a shower. All that remained was buying glass. We bought our frameless shower glass from Kyle's Glass in Oceanside. Kyle came by our home within a day of calling him, made measurements on the spot, and gave us the lowest quote out of two other vendors. When our first quote came in at $1690, the second at $1675, we knew the glass would cost us in the $1600s. Kyle's quote was $1615 so we saved a few dollars. His company's motto, "High Quality, Low Prices," was spot on. Check out the shower glass door below. Now onto the project numbers. Below is an expense summary of the project. With the exception of the floor tile, all of the stone for our project was purchased at Granixstone.com. Their prices and selection were unbeatable. 2, Lapidus slabs (111.4 sq. ft. total) @$595 each. $1,285 with tax. 1, Lapidus slab (53 sq. ft.) @$475. $513 with tax. Originally, we'd only bought two slabs. 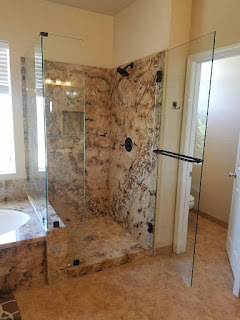 But we added granite to additional areas (the shower step in, the window seal, soap/shampoo dish). We'll also have enough left over to put granite on a small countertop below in our guest bathroom...so it is not going to waste! 14 sheets of 2'' x 2'' (1 square foot each sheet) Tumbled Gold Mesh tile for the shower floor. Total with tax was $124.74. 2 porcelain rectangular undermount sinks. Total with tax was $105.84. Home Depot, 20 inch by 20 inch white-bodied (clay) Ceramic floor tile. Color: Mojave Sand. Large Tile Mortar 50 (3 bags), Notch Trowel, Grout bag, and Spacers. Total with tax was $253.51. Only $0.99 per square foot! Chalk reel, Makita 4-1/2 diamond blade, Makita grinder, and molding bar. Total was $114.38 with tax. Drywall screws, liquid nails adhesive, caulk gun, and 6 sheets of hardiebacker board. Total was $120.24 with tax. 2, Moen brand oil rubbed bronze sink fixtures, 1 Moen brand oil rubbed bronze shower fixture with handle, and 1 Moen brand oil rubbed bronze bathtub fixture. 1 oil rubbed bronze toilet paper holder. Plumbers putty. Total was $668.22 with tax. Lowes, 1-gallon and 1-quart, "Churchill Wheat Hotel" color Valspar paint, Purdy 2-inch brush, FrogTape, 9-inch rollers, caulk, and other floor tiling products. Total with tax was $153.22. Wet Saw: $0, borrowed from friend. HardieBacker boards for floor, and screws: Grand total with was $192.15. 3-Light oil-rubbed bronze fixtures, 6 sheets of Glass mosaic tile for mirror border, and grout. Grand total was $191.84 with tax. Bottom line is that you are all more than capable of doing what I did to save thousands on remodeling and adding more value to your home. By becoming the contractor, and doing some of the work yourself, especially the demo and set-up, you'll be well ahead of seeing your dream room come to fruition. 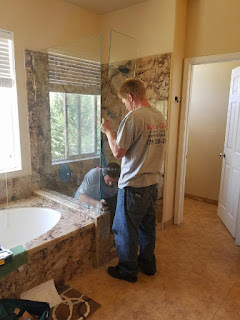 Please comment and let me know what you think of my bathroom remodel project for under $10K. ALSO, please subscribe to this blog before you leave by entering your email above. Thank you! Nice work! Looks very much improved. The washroom of the house really says a great deal in regards to its proprietor. In any case, many individuals don't really consider outlining their restroom since they regard it is as a minor part of the house.